We have organized a program with dealers of electronic items in the premises of Govt. of School, Siyaganj, Indore on 14 June, 2017 from 1.00 PM to 4.00 PM. This program has been organized by us in association with Arunodaya Lok Kalyan Samiti. Apart from its director Mr. Vyas, other staff members of the organization and MPVS staff were also participated in the program. First we have conducted a base line survey among the dealers of the electronic items in the nearby townships and informed them about E-waste awareness campaign being organized in Indore City supported by Govt. of India. Then, we have invited dealers of the workshop. Approximately 32 dealers have been participated in the workshop. 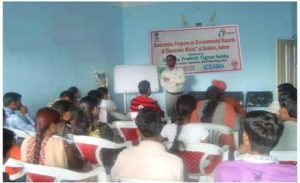 There was a long discussion and question answer session in the program regarding various aspects of E-waste and need of its proper management. 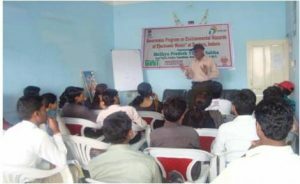 The program was very beneficial to the participants and asked for similar program in other areas of Indore City.